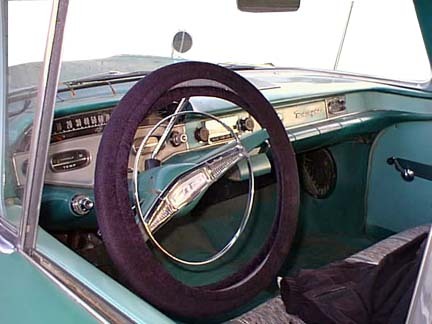 In 1952 the windshield of a car was still in two pieces. 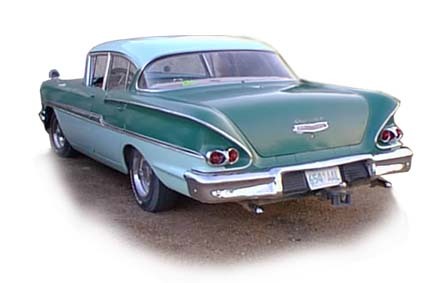 The 1955 and 56 Chevy shared the same frame and styling with a wrap-around windshield and for many people the best of all was the slightly larger and more powerful tailfined 57. 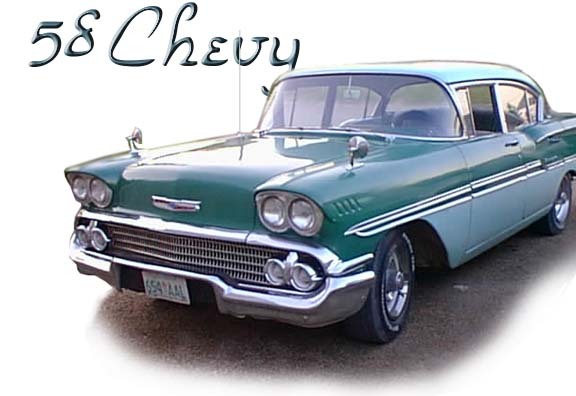 But the 58 was almost entirely a new car. 5,800 pounds of steel and chrome with a selection of V8 and a standard six cylinder valve in head engine with either the "Powerglide" or standard transmission. This car was substantially larger then the 57 and road with the kind of smoothness that four cowl springs could provide with that much steel. and mirrors that were typical add on features of the period this looks pretty much like the ones that came out of the showrooms and onto North American highways. The gas cap is hidden under a panel below the trunk lid and the owner of this one has added a trailer hitch. Certainly this was a car that could handle a trailer. I used my Pontiac version of the same car to haul a 32 foot house trailer and it was hardly the sort of thing we see in travel trailers today. Built in Windsor Ontario and loved by their owners. The following year General Motors radically changed the style once more but under the skin the frame and chassis were the same. The 58 was the last car to wear paint as the 59 was covered in acrylic. Sturdy, dependable and fairly crash worthy these were excellent cars. A couple of days after this article was published a printed copy was given to the owner who told this story about his prized car. (August 21, 1999) - The owner was living near Meath Park and had seen this derelict car in a farmers yard. It was in pretty tough shape and he went to the farmer and inquired if he would like to sell it. The farmer said he would give him the car if he would fix it up and so the rest is history. The owner has had it for more then ten years and continues to enjoy it in its original state. 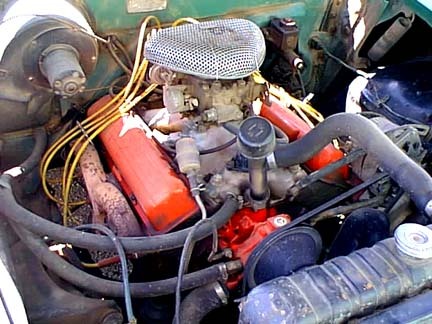 There was one modification to it that would have been fairly common at the time and that was to add a manifold header and larger carburetor to the original 283 V8. This summer the owner wanted to take his wife and family on a holiday and use the family Lumina to pull a modest travel trailer. The wise folks at Bow Mar told him it wasn't a good idea so the trailer hitch was added to the 58 and off they went to the Rockies and it performed admirably. Today (Saturday August 21) this car is in Saskatoon for "Cruise Night."